This is a letter from a father of twin daughters that you will never read. Now I am not the only one to have daughters but I am obviously better suited to relate to the emotional whirlwind that I have experienced since they first arrived as mere bundles of meat and skin with bleary eyes. I agonized over their incoherent cries not knowing what they wanted. There were times when they were sick and inconsolable leaving my heart in knots. Dear Father, you are the best! Gradually, they grew up and found their feet and mumbled their first meaningful words. They washed away the Tendulkars, Schwarzeneggers, John Grishams and Ghulam Alis of my world with their own being. There were only so many I could take. When they started going to school there were times when I felt like whacking their teachers when they compared my starlets with the hoi polloi of the earth. And such emotions were returned by the twins by an unconditional sea of love. Then they grew up some more, developed their own likes and dislikes, hates and desires, started asserting their personality on people and surroundings. There were the inevitable tussles over Tom and Jerry shows and incomplete homework, Mcaloo Tikki burgers and ‘healthy food’. At times I felt like a recalcitrant General who has to concede territory to the very troops he has raised. But concede I did. Today, I have no way to ascertain the bond you shared with your father but I am sure the core emotion would have been the same. My daughters are yet to grow into restless teens but I am bracing myself for their introduction to social networks like Facebook, texting, tweeting, mobile escapades or God forbid, darker strains of emotions. Sitting in a cavernous departure area of an airport in May 2008, I saw your face splashed around on news channels and learnt of your grisly end. As the events unfolded in the successive days, all I could think was ‘why’. Why at all, a human would slaughter a hapless blossom with the nonchalance of a butcher. No act of omission or commission by you, your parents or any human for that matter, can ever justify the sudden brutal end brought upon you. I have been directed to long write ups at the ‘Open Magazine’ titled ‘Worse than a Daughter’s Death’ and the ‘Tehelka’ of which I found the former specially touching even if it sounded hollow at places. It certainly drives home the exasperation of both the police and the CBI who feel annoyed when disturbed with such petty matters that withdraw them from more important business of wasting taxpayer’s money or taking bribes. There methods combined with the judicial system of this nation can put several Abu Ghraib camps to shame. I also fail to understand why CBI has denied the LCN DNA tests your father has been hankering for. Yet, I have not eaten back the words that I pronounced in the anguished courthouse of my soul, “Wake up Talwars. Time to die.” They will remain dangling in the eternity for none can expunge the first and foremost charge of irresponsible parenting from the Talwars. I have scoured for days for whatever was suggested to me: magazines, webpages, forums, theorems, thousands of comments, and also the recent closure report of the CBI. It certainly got murkier and murkier the more I read till I could not bear. I am afraid we may never be privy now to the sequence of those dark deeds buried in the bosom of a darker night. But nothing that comes to fall upon your parents, or the putrid intruder if indeed there was one, be it through the media or the police or the CBI or the unpredictable judicial machinery of this land, will ever wake you from the eternal silence you have been consigned to. 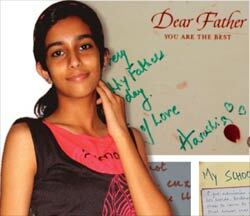 So, forget it all like a terrible dream and rest in peace, Aarushi, Rest in Peace. If the CBI theory is right, I hope they get Talwars to confess. It is very unlikely though. Hemraj’s phone has responded from Punjab (I think it was switched off as soon as it rang) – how did it reach Punjab? Who locked the Talwars inside their house? Whose was the size 8 shoe-print on the terrace near Hemraj’s dead body? Where are the bloodied clothes worn during the two murders? The murder weapons too are still not ascertained. And most of all, the motive. There is no one way for grieving for one’s child, each parent grieves in their own way. Not crying is not a sign on indifference, it is a powerful defence mechanism, because if the pain is severe, the crying may never stop (or so the parent feels). Shock is a blessing, it kind of numbs the system until one is able to bear the unbearable, so I would never hold their facial expression against Aarushi’s parents. Indian Homemaker, I noticed you have been defending the Talwars tooth and nail on various fora. I am sure you have your compelling reasons like the ones you have just put forth. They are good enough to stop one in the tracks but then there are many more questions which are equally perplexing. For instance, even if Hemraj’s body was decomposing for two days, how could Rajesh fail to recognize him on his own terrace? It is extremely unusual for a man to forget even the clothes of a servant of many years in a matter of two days. Oh no, this not a court room. I have shifted my stance to acknowledge that there is no way I can be so sure of Talwars being guilty. But how are you so sure, the other way round? It is convenient indeed for the so-called investigative agencies to find a scapegoat and shut the case rather than fishing out the deranged killer(s) from a chaotic ghetto of billions. They have shown an alarming propensity of doing just that. Are we then fit enough to be called a nation? Shouldn’t we scrap our Constitution and call in the army? I am not saying that Talwars are guilty or innocent, like you, I just am not convinced either ways. But I am quite disgusted by the family’s baseless character assassination by the media and the the police. According to Rajesh Talwar, Hemraj’s face was swollen and he hesitated in saying it was him. Police is making a big deal out of nothing, Rajesh Talwar’s not recognizing Hemraj would have made no difference, Dr. Talwar knew the neighbours, other servants who knew him, etc would have recognized and identified him anyway. Why would he try to hide his identity? I don’t think it proves anything. I do have sympathy for the parents, because they could be innocent and if they are, then what they could be going through doesn’t bear thinking. I don’t know if the Talwars are guilty or not. In fact, nobody seems to know, or even if somebody knew, he or she is not telling it. But if someone asks for my opinion, I will say yes, they killed their daughter. I have watched them a number of times in various news channels, and to me it appeared that they made extraordinary efforts to convince the world about their innocence. Both of them patiently and painstakingly explained why it could not have been them. Now it is perfectly understandable if someone tries to clear his name or establish his innocence. But something about them was phony. I am a parent of two daughters, and in a similar situation I would have been too distraught to bother about convincing the world of my innocence. They were too logical, too calm, too earnest – not how you would expect parents too behave in such a tragedy, unless they themselves were the perpetrators. This is such a sad story. I have no clues. Therefore can’t give any verdict. Firstly let me say if i have not done in my earlier comment that yours is one of the finest design blogs i have seen. I know i have a role model to follow. This is a very touching post, very humane and balanced. I dread the day the truth will be known, but know people – known and unknown like you , deserve to know what happened that fateful night. Thanks for the kind words, Mayank. The design, however, belongs to the WordPress theme INove by NeoEase. No one will ever know the truth will they? But a girl so young died, her memory sullied beyond repair. May her soul find salvation. Your article is really awakening and shows your stupendous mastership that really touches core of the heart.It is the Mother and motherhood only which instigates a father to be a Father(hope I am not challenging different psychological-theories. )Nupur is more responsible. Through their reflections,expressions and balanced replies to the media,they tried their best to befool the whole nation.But unuttered words and unexpressed expressions revealed more.They are the perpetrators. Please do write regularly as your articles deflect readers towards a very genuine domain of unearthed human emotions. Dear Mr. Verma, these are but outpourings of a listless mind; thanks for taking note. As for your conviction, and also AB’s, regarding the guilt of the Talwars, here’s hoping they reap the grim harvest of whatever they sowed, year after year. as you said forget everything and rest in peace! Former additional solicitor general Amarendra Sharan who played a key role in getting Priyadarshini Mattoo’s killer nailed is of the opinion that an accused or a witness may lie but circumstances do not. Circumstances are crying themselves hoarse against the Talwars. You have hit the nail where it matters most. A wonderfully penned down letter to someone who might probably not read it but I surely hope she does. The apathy by the officials in this case, is shocking. RIP Arushi! Vineet, I wistfully hope so. That was the cry from the bottom of the heart of a loving father with little girls of his own. And that makes it a poignant one. The merits and demerits of the case, the question of who is guilty and whether the Talwars are really the culprits is secondary to the fact that a child has been brutally killed in her adolescence. Like you have exhorted, we should all pray for her soul to find peace. Zephyr, you are clear, direct and soothing as ever. Amen.